« A Reprieve for Public Education? Although it is fundamental that new art builds upon that of the past, it is not often that we have a clear and obvious example of this with near-immediate worldwide effect. Fortuitously, a new artwork, la Nueva version de Ecce Homo de Borja (AKA Furry Jesus) demonstrates that process quite literally. The new work was physically constructed upon the old. Both the new and old Ecce Homo are located in the Santuario de la Misericordia in Borja, Spain. 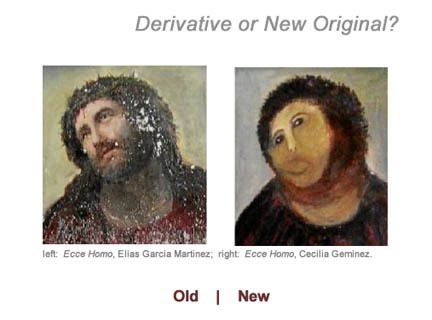 Although the city of Borja has apparently initiated plans to attempt a “restoration” of the foundational version of Ecce Homo by Elias Garcia Martinez, an online petition (several actually) have arisen in an effort to stop the hasty removal of the nueva Ecce Homo by Cecilia Gimenez. One petition author suggests that the new work represents a subtle criticism of the church’s theology, creationism particularly. The work can also be interpreted as a comment upon modern copyright law. As a conceptual piece, (nueva) Ecce Homo is not only a physical work; the act of creating the work itself is fundamental aspect of its meaning. This entry was posted on August 25, 2012 at 4:14 pm and is filed under art, Europe. You can follow any responses to this entry through the RSS 2.0 feed. Both comments and pings are currently closed.